We have been either on anchor or on a mooring ball for the past 5 nights and one more tonight which means no wifi and no moving pictures from my phone to the iPad. So I have decided to post without them to give a bit of an update. On Sunday 12/6 we headed south toward Sarasota. We stopped at an anchorage about 10 miles from there because of time and found ourselves aground because we misread directions, water, and the channel markers but good old Boat US pulled us off the sand and we anchored safely with no problem. Al has always said "there are 2 types of boaters, those that have run aground and those that will". I also need to make a comment about the speeding situation! Cap Al is more conservative than I even want him to be and he went from a really slow area to an area that allowed "resuming to safe speed" which is a subjective concept. We had been rocked many times by "Go Fast" boats all day! So he gradually increased speed and suddenly a cop boat was at our side as we approached a bridge that was tricky to get under. Long story, short, this cop was having a bad day, he finally let us get under the bridge safely and then yelled some more at us on the other side until he let us go. Completely unprofessional and wrong!! It left me completely shook up and was unfounded! Lastly, yes we did leave one of our antenna up as we approached a low bridge but that was just memory error. We lowered all 3 attenae many times and just slipped up once. I still trust my Cap! This is the view toward the East which is Sarasota. While in Sarasota, we walked 4+ miles to see the Ringling circus museum and their home and art museum. Had some pics of that but no real loss! Another unbelievable sunset looking at Longboat Key! Each day we usually get a walk in so we used that on Tuesday to hit up Whole Foods in Sarasota and continue heading south. 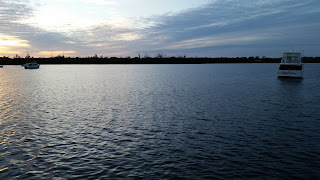 We anchored one night in a neighborhood cove and then landed just East of Cayo Costa. We went through all kinds of bridges and passed lots of small islands. We even passed a steam powered little boat that looked like a little toy! We passed so many dolphins that provided unbelievable entertainment and then ended up near Cayo Costa which I have already mentioned in the dolphin post. Any pics of the beach are on my phone but know, we have been over to the beach for the past 3 days and are very happy and relaxed!! Tomorrow we begin a 4 day cruise across 160 miles of West FL. to East FL. We will leave the boat at Stuart boatyard while we enjoy Christmas at home. More in about a month! I have more pictures to post but since we are on anchor the service is poor and many pictures are slow to move to google photos for posting. So will include some later. In the mean time, I have a bathing suit on while I sit on the flybrige and this is what I see! After we eat a lunch which will happen after the Captain wakes from his noon nap, we will go explore Cayo Costa, a barrier island with more white sand beach to walk and more shells to collect! The First Mate was kind in her posting covering Sunday December 6th, however the Captain feels the following three milestones should also be included. 1. Pulled over for speeding. 2. Hit fiberglass vhf radio antenna on highway bridge crossing. That is it. (Details may be forthcoming on request, at my discretion.) Over. Well a good 12 hours of sleep does wonders and we are happy with boat travel once more! We turned our Tuesday walk (12/1) into a visit to Clearwater beach. Beautiful white sand and lapping waves. I called our good friend Glenda who was on vacation in Clearwater many months ago for a recommendation for a lunch place. And here we are for a late afternoon repose. Wednesday I felt compelled to finally finish the jigsaw puzzle to end the Thanksgiving week and to neaten up the salon because we had guests coming. So before our walk I did it!! Luckily, we have a nice table that opens up to allow a 1000 piece puzzle to fit. And back in the box it went! We then, Wednesday morning, went back north 6 miles to a great marina in Dunedin which offered a special price for loopers for a very nice slip in a clean and friendly place. We had mail sent to the son of an old buddy from Firestone that we wanted to meet up with and also Al's college roomate and wife planned to visit us there. But when we arrived we learned that a wonderful Christmas boat parade with an all day BBQ was scheduled for this past Saturday, so we signed up to stay 4 nights. Sooo nice to not have a schedule!! We spent a wonderful day on Thursday on Caldesi Island, a dingy ride from our marina. Another beautiful, white sand beach with Randy (Al's college roomate) and wife Nancy as we walked along the windy Gulf shore. Our friends from Sandrobber also took their dingy over to the island and Sandy and I went on an extra walk along a wildlife trail and the only species we encountered was an orbweaver spider. Friday was a day for some shopping and a trip to Tarpon Springs for some Greek food! Then Saturday happened! Not in good order but fun pics all the same! Our Santa was actually a young man from Gallatin, TN who now dives and cleans boat bottoms and does other under water repairs while living here in Dunedin, FL. He was happy to meet up with other folks from near his home port. A great kick off to the holiday season!! Today, we passed by the Sunshine Bridge in Tampa Bay on our way to Longboat Key area. A little house and a great big house in the Florida ICW. Tonight we sit in an anchorage near Sarasota and are very relaxed and content. We headed out of East Pass with low rolling waves so to be cautious I chewed up a Bonnine Tablet to head off any feelings of motion sickness. We were pshyched! Dolphins escorted us to the pass so I chalked that up as a good omen that King Neptune was blessing our journey! I sent a text to Al's sister and to Erik as we left so they would have enough information to notify the Coast Guard if we didn't arrive in Clearwater by evening on Monday. That is a standard safety precaution for open water crossing. Heading to the buoys marking the Pass. The Garmin showing the line we were headed on via Mr. Auto Pilot (on the left) and the location of our boat buddies in relation to our boat (on the right). When it got dark, the screen was our way to know everything we needed to stay safe while traveling with other boats near by. We set ourselves about 1/4 mile apart as a safe distance. 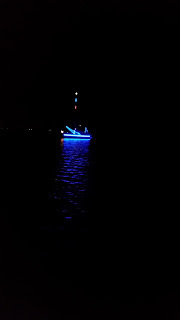 All night we could also see any other boats within miles of us. Our radios were set to 16, the universal hailing frequency and we also had one scanning channels to listen in on other boats chatting to keep up with them and also to keep us from getting bored! We knew of at least 2 other groups of boats on the loop that left just after us. It was kinda fun to travel knowing so many boats were out there with us. The white dot is Liquid Assets bringing up the rear just as the sun was beginning to set. Finally the sun began to rise and you can see the saltwater wash on our windshield from the waves all night. At this point we were kinda numb but still awake. While it was dark, we used the inside helm but once the sun rose, Al went back up to the flybridge and almost slipped off because it was so wet and we still had rolling waves on the bow. I stayed put holding on to the helm station to steady myself. It was a very good work out for our core muscles because the balance challenges were contstant. So that is why my poor little ankle is a bit sore still today! This is our boat going under the bridge on the ICW as we headed further south to get to Clearwater. Finally we are out of the Gulf and the waves. One friend who lives here told Al this morning that the weather reports for Sunday night were dead wrong and we can attest to that! Here we sit in the calm water of the ICW nestled between the white and dark blue boats. After 12 hours of sleep last night, we are ready to take on a lovely beach walk and put this crossing story behind us!